I had the fantastic fortune of working with Michelle Merkin during a pivotal time in my partnership with my mare Sophie. Sophie was transitioning from her career as a hunter to dressage and was recovering from injury and conditioning issues. . Under Michelle’s guidance my lovely 14 year old mare blossomed--and so did I! Michelle’s lessons are much more than your rudimentary arena work. Michelle is a very interactive instructor, her insightful analogies and thought out exercises instill a full understanding of the concepts riders are working on. Her non-combative, supportive instruction/training style propels rider and horse to a more cohesive partnership. 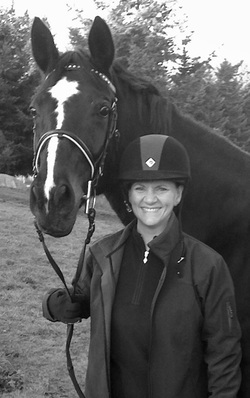 Southern Oregon is very lucky to have this wonderful equestrienne as a resource. 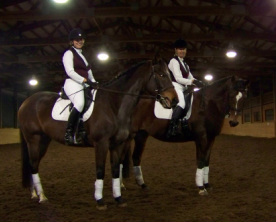 Michelle's uniqueness as an instructor is her ability to combine detailed attention to the technique of riding with a creative feel for the art of dressage. In one lesson she may work with me about the angle of my shoulders and then ask me to move my trot rhythm into dancing with my horse at the canter. 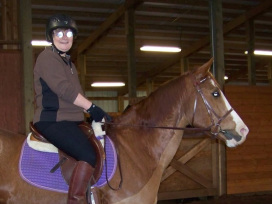 Her love of horses and dressage is an integral part of who she is. Michelle is an OUTSTANDING riding instructor. I have learned more in three months than I ever learned in 5 years taking riding lessons at another riding facility. She provides strong basic riding and safety skills and teaches how to become “one with the horse.” Michelle is very effective at using analogies to help a person understand concepts, explaining and demonstrating what a rider needs to do with the horse to learn specific riding skills, and giving exercises to do at home to enhance one’s riding abilities. She reinforces the positive of what one is doing well, while at the same time helping one to make needed corrections and to “take the next step” as a rider. Without reservation, I can say, Michelle is the BEST teacher I have ever had, for any subject or learning experience!